The 19” train unit of the train collision avoidance system is intended to be mounted in standard 19” rack installations available in most modern locomotives or passenger trains. It contains a processing module, a communication module, a localization module and a power module. The train unit acts as the heart of the collision avoidance installation in each train, being connected to peripherals such as communication & navigation antennas, additional sensors, one or more train driver displays and battery system. 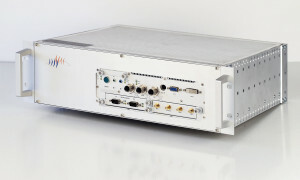 The main processing module is an EN50155 certified industrial rugged embedded computer designed for railway operation. The direct train-to-train communication (i.e. no base stations required) is based on TETRA radio which operates on a frequency band between 380-470 MHz and is one of the key assets of the approach. Simply when in range (i.e. closer than 5km), trains exchange information about their position on the track, speed, driving direction etc. using this communication module. The localization module consists of a multi-sensor setup combining a GPS and a 6 degree-of-freedom inertial measurement unit (IMU) in a very innovative way, which fulfills the demanding cross-track accuracy and localization availability requirements of the collision avoidance application. The unit internal power management has a cascaded architecture. An EN50155 certified galvanically isolated, transient and short circuit protected power adapter supports a wide input range of 14,4V-33,6V. The 19” unit consumes a power of 50W in average, with peaks below 75W. A variety of train driver displays can be connected to the 19” unit, depending on the customer’s requirements. The most recommended option is an EN50155 certified intelligent display with touch sensitive areas or simple border buttons. Depending on the customer requirements, alternative HMI options are available.